Rye alcohol may elicit nostalgic images of old Americana, but this unique flavor of whiskey is making a comeback, according to a November 2013 article on the The Wall Street Journal, MarketWatch website. Unlike other whiskeys, rye alcohol must be made with a mash that's at least 51 percent rye grain. However, the calorie content of rye is very similar to that of other distilled beverages, including whiskey, vodka, tequila and gin. On average, a 1.5-ounce shot of rye whiskey contains about 104 calories. 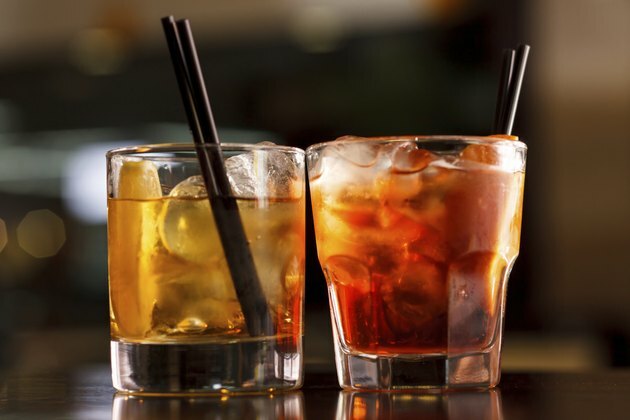 If you sip your rye neat or on the rocks, one drink can easily fit into a well-balanced diet. If you take your rye mixed in a sugary cocktail, however, the calories can add up quickly. For example, a Sazerac made with rye, sugar, bitters and anise liqueur may contain about 164 calories per serving.